How can I tell if there are mice in my house? As well as causing damage to your home, mice carry disease – making an infestation potentially dangerous as well as unpleasant. In addition to making the most of available food, mice also like to gnaw on plastic and wooden furniture, and have even been known to cause fires by chewing on electrical cables. If you think you caught a glimpse of a mouse but can’t be certain, try putting down some talcum powder on pieces of paper or cardboard in the corners of your rooms. You’ll see footprints or tail marks if there’s a problem. Also, you’ll be able to see how many rooms are affected. If you’ve got a problem with mice, Which? Trusted Traders has endorsed pest controllers in your local area. Mice are often more active at night. If you don’t see them, you can frequently hear them scratching around. There are several other tell-tale signs to look out for, too. A house mouse only eats 3-4g of food each day, but will produce up to 80 droppings. Fresh mouse droppings are black, shiny and the size of a large grain of rice. They produce droppings as they’re moving around, so you can find them on the kitchen surfaces or elsewhere in your property. It's common to see little bits of damage in lots of locations, rather than a lot of damage in a single place. Mice will often gnaw on packets of food. Look out for holes in cereal boxes and bags of rice. A mouse may also damage boxes, wallpaper or furniture. A mouse infestation is often accompanied by a distinctive musty, pet-shop type smell. You can often hear mice scratching around at night, when they tend to be more active. 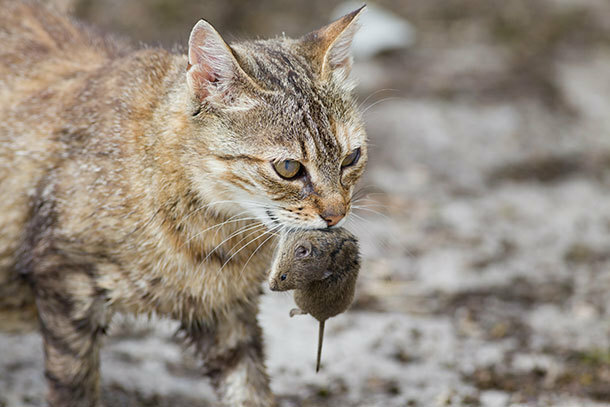 It’s always best to work on deterring mice in the first place, rather than removing an infestation. The best preventative measure is to close up the holes they use to access the property, but that is a big challenge. A mouse seeking food, warmth and a place to nest can squeeze through gaps of 6mm and larger. It’s worth investigating the following areas. Go outside and have a careful look at your property. Look for cracks in brickwork, air vents, grilles or gratings. Airbricks and grilles should never be sealed completely. Instead, buy a mesh with a 5mm or smaller lattice, and attach the edges using silicone sealant. You can tackle small holes and cracks with sand and cement. You can fill larger holes, such as those left by plumbing work, with a combination of chicken wire and expanding foam. Modern PVC doors don’t usually cause a problem, but wooden doors often have a gap at the bottom that’s bigger than 6mm – ample space for a mouse to squeeze under. You can tackle this by fitting a 'bristle strip' or draught excluder to fill the space. But don’t leave your doors open. ‘In the summer, mice will often just walk in through open doors or windows,’ Philip Voller told us. Ivy or another plant that grows up the side of a house is a convenient ladder for mice to climb to a higher level. There is little point sealing up the ground floor if there are other places for the mouse to enter higher up. If other mouse-control measures fail, you should consider removing climbing plants. A pet’s food bowl placed outside will attract mice, as will plastic bin bags – put those into a wheelie bin straight away wherever possible. Keep your garden tidy. An overgrown garden will attract mice and other pests. It is possible to put down poison yourself. However, our Which? Trusted traders don’t recommend this, because of the danger of putting it in the wrong place. If this happens, it is ineffective at best, and at worst a danger to your family, pets or other animals. The strength of over-the-counter poisons has reduced as people are more aware of the danger to the environment and the threat of building up resistance. On the whole you are better calling in a professional. Which? Trusted Traders has endorsed pest controllers in your area. If you do choose to go ahead and put down poison yourself, ensure you read the instructions very carefully and abide by them to the letter. DIY shops will sell kits involving crystal-type substances on trays. Position the trays at the edges of rooms behind furniture. Ideally, they should be out of sight and, especially if you have children or pets, out of reach. Be sure to remove all other sources of food first. Mice will need to be desperate for food before they will eat poison. They will eat wax crayons, bars of soap or cardboard first. It is possible to buy humane mouse traps, which trap the mouse in a box rather than kill it outright. However, this method is possibly not as humane as it seems. ‘This can be useful if you’ve got a really big infestation, but people have to dispatch the mouse themselves, once it’s been caught, which a lot of people don’t like,’ Philip said. If DIY methods fail, or you believe an infestation is becoming serious, you should call a pest-control professional, who has the experience to deal with the problem. A three-treatment job, which is standard practice, will usually cost between £125 and £200. The bigger, national pest-control firms charge more, though. Which? Trusted Traders endorses pest-control businesses, to ensure they operate according to the latest regulations and will treat their customers fairly. You can use our online search function to find a pest controller in your area.